By Clemente Lisi – NEW YORK, NY (Jan 16, 2017) US Soccer Players – Although many Americans are unaware of it, soccer has a very rich tradition and a deep history in this country that dates back decades. The National Team played its first official game in 1916 and over that 101-year span, the United States has featured scores of players who’ve proudly represented the game at its highest levels. It's what the National Soccer Hall of Fame is for, remembering the names we know and learning new ones. That's especially true for the players who made their mark when the sport didn't have a high profile in this country. Players built friendships – many on the field and some later during various Hall of Fame ceremonies – that have endured for decades. These friendships have lasted long after people had forgotten their accomplishments and nothing remains but black-and-white photos and yellow-stained newspaper articles. This is the story of George Brown and his friend, Gene Olaff, who at 96 is the oldest living player to ever represent the USA. “He’s my best friend. He’s a terrific guy,” Brown said. “Unfortunately, he is not doing well. He is up there in age.” Olaff was too ill to speak about his exploits, but Brown – a former player and preserver of the American game – was more than happy to fill in the blanks of the goalkeeper’s amazing career and their friendship over the years. Olaff grew up in New Jersey, the son of immigrants. His father was from Sweden, a sailor-turned-postal worker. His mother hailed from Scotland. He grew up in Bayonne, just across the Hudson River from New York City during the 1920s. Soccer was big in Bayonne since it was a town of immigrants who had brought the game they loved over with them from Europe. Already 6-foot-1 by age 14. Olaff had played baseball, but traded his glove and third base position for the chance to play goalie given his height and frame. At the time, New York and its surrounding area was home to some of the country’s strongest ethnic leagues. The demise of the original American Soccer League in 1933 in those post-Depression years made it so that soccer no longer had a chance at national prominence. Instead, the game survived in cities across the country like New York, Philadelphia, and St. Louis. “The regional leagues had strong clubs who nurtured their own players like teams did in Europe,” Brown recalled. In 1936, Olaff – known for playing with a baseball cap and long pants – signed with New York Brookhatten who competed in the ASL. Despite his time in the ASL, Olaff is most-famous for his time at Brooklyn Hispano of the Southern New York State Football Association. He played for the club from 1941 until his retirement in 1953, with an interruption for serving in Italy during World War II. His biggest accomplishment was winning the double in 1944 – both the league title and National Challenge Cup – as the US Open Cup was known at the time – in the same season. Soccer wasn't a full-time job for Olaff, Brown, and other players in that era. Players had to make a living during the week, and only played soccer on weekends. In Olaff’s case, he worked as an officer for the New Jersey State Police. Although Olaff got weekend passes to play for Hispano (and made one appearance with the National Team in 1949), he did not get the same dispensation to travel to Brazil to join the National Team for the World Cup. The rest, as they say, is history. The Americans stunned England 1-0 in 1950, to this day one of the greatest upsets in the tournament’s history. Brown, 81, reiterated that sentiment, saying Olaff had told him the same thing whenever the topic came up. Brown and Olaff became fast friends and worked together to build up and organize the National Soccer Hall of Fame that until 2010 was in Oneonta, NY. For years, they worked together on the Veterans’ Committee, spearheading the revision of eligibility rules and voting procedures that ensured that a veteran player was inducted in recognition for what they had accomplished in the past. Brown, meanwhile, had first-hand knowledge of America’s soccer past since soccer had been in his blood. His father, Jim, had been a member of that fabled US team in 1930 that had reached the semifinals at the very first World Cup that year. Jim Brown, who was born in Scotland, scored the lone goal for the US in its 6-1 loss to Argentina in the semifinals. He had also played in the original ASL and later returned to Great Britain, where he enjoyed a successful career at Manchester United and Tottenham Hotspur. George Brown played alongside his father for two years starting in 1950 with Greenport United in the Connecticut State Amateur League, which Jim Brown had founded upon his return back to America. George Brown went on to play with several clubs, but had the most success with the New York German-Hungarians of the German American Soccer League. At that time, the team featured some of the best American talent in the country, including John Souza, Walter Bahr, and Joe Maca. He won the GASL MVP award in 1953 and helped the US win the bronze medal at the 1959 Pan-American Games. Jim and George Brown are the only father-son players to make it into the Hall of Fame. Brown would go on to earn just one cap for the National Team, a 6-0 loss to Mexico in 1957 in a World Cup Qualifier played at the Estadio Olimpico in Mexico City before 75,000 fans. Brown bemoaned the lack of organization and training the National team had in those days. Brown would go on to have a successful career working for Exxon for over 30 years and in 1999 moved to Oneonta to work with the Hall of Fame. He served on the Hall’s Board of Directors and his wife Peggy worked as the archive manager. Brown also created and edited the Hall’s newsletter, “The Hall of Famer,” and in 2006 served as interim president. 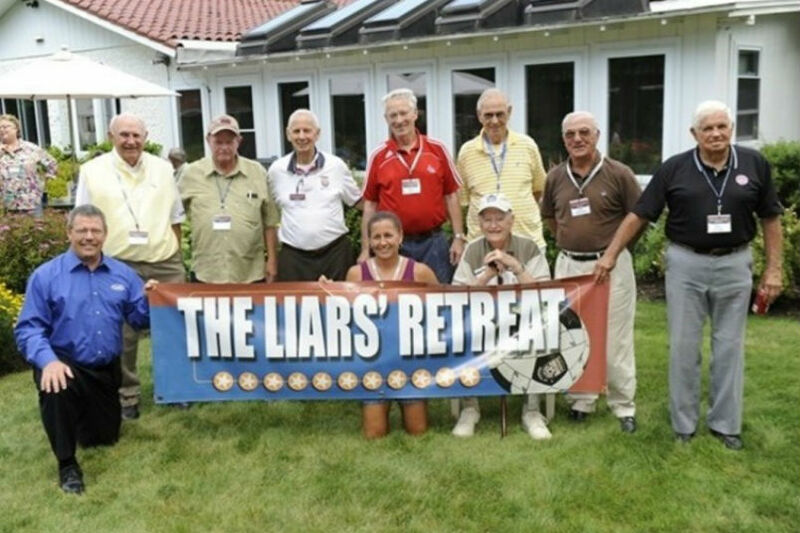 During his time in Oneonta, Brown and his wife hosted an annual party known as the “Liars’ Retreat” at their home, where players reminisced about the past. The gathering got its name, Brown said, since the more they reminisced, the more goals the players recalled scoring. Editor's note: Gene Olaff died on Jan 17, 2017. The US National Soccer Team Players Association would like to offer condolences to the family and friends of Mr. Olaff and thank him for what he did for soccer in this country.